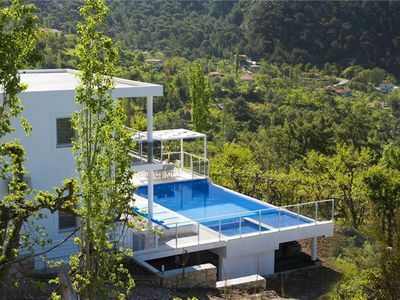 Villa Rudi is an exceptional, luxurious fully air-conditioned, 2 bedroomed, 3 bath villa, built in 2016, situated in a unique and serene setting amidst the olive groves and pine trees in the beautiful mountain village of Islamlar. Islamlar is renowned for its trout farms; restaurants serving fresh trout, slow-cooked lamb and other local delicacies. 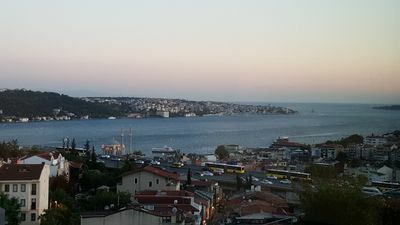 If you prefer to dine at home and drink in the enchanting sunsets with a glass of wine, there are three nearby markets selling local, organic produce. It is a perfect base to explore the historical sites of the Antalya region or as a tranquil retreat to while away the day. 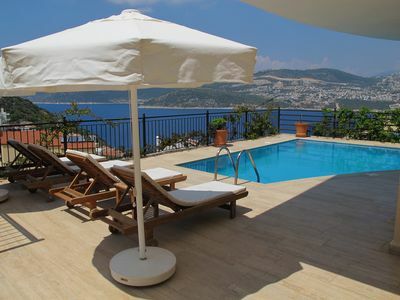 The villa offers guests complete privacy and yet is only a 15 minute drive to the lively resort of Kalkan. 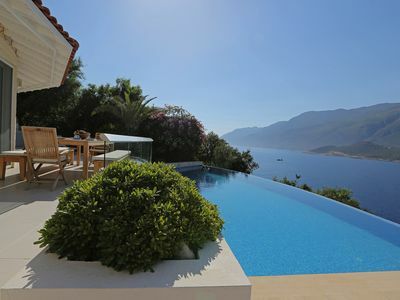 Every room in the villa has stunning uninterrupted views of the Mediterranean, Kalkan islands and Patara Beach. There is a large main swimming pool with two incorporated wading pools, outside shower, fully shaded dining area, and outdoor furnishings. 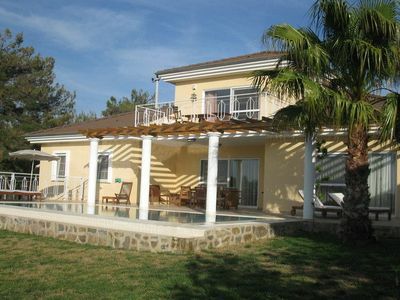 Downstairs, the villa is open plan with a large well-equipped kitchen with new Siemens appliances throughout and a breakfast bar . 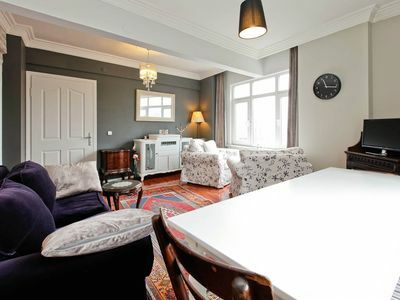 The dining area seats 8 and the living room has a large comfortable corner sofa unit. There is a wi-fi based television and audio system. A toilet and shower room with a power shower completes the downstairs area. Upstairs, there are two huge en-suite bedrooms, one of which as a separate jacuzzi in the room and both en-suites have walk-in power showers. 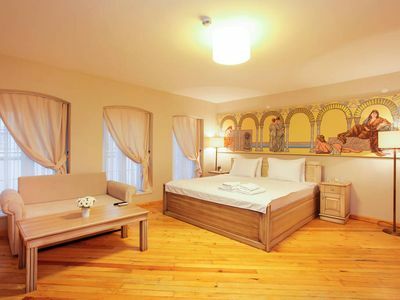 As with downstairs, both bedrooms have fully integrated wi-fi television and audio systems. There is a full-width terrace, leading from both bedrooms overlooking the pool where guests can enjoy magnificent views of the orchards, the valley and the sea. 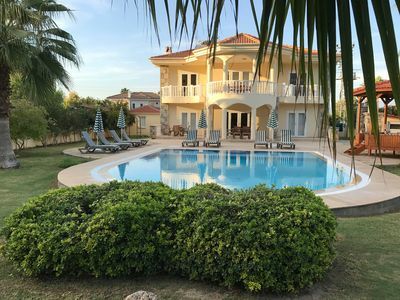 Villa Rudi is suitable for honeymoon couples, romantic holiday, luxury villa holiday, halal villa holiday with secluded pool, infinity pool is not overlooked so its one of the best luxury holiday villa in Turkey. Hob, oven, fridge, washing machine, dishwasher. Iron and ironing board, safe and hairdryer. TV/DVD, CD player, wi-fi internet access. Air conditioning throughout. Private pool with infinity edge 12 x 5metres. Constant depth of 1.70m. Pool towels provided. 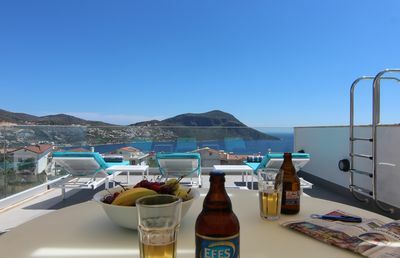 The sea and beach clubs in Kalkan town are approximately a 15 minute drive from the villa. 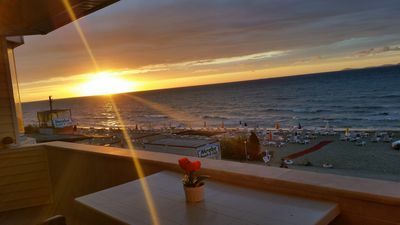 Both Kaputas beach and Patara beach are approximately 25 minutes' drive from Islamlar. There are 3 small grocery market in Islamlar serving essential items and a handful of very good 10 local restaurants with a few minutes drive. 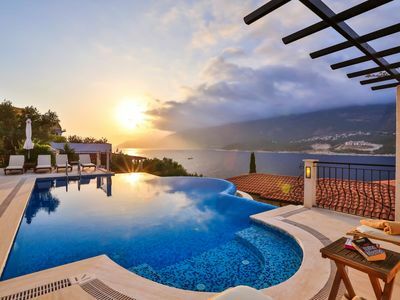 Kalkan town, a 15 minute drive, offers larger supermarkets and a weekly fruit and vegetable market. 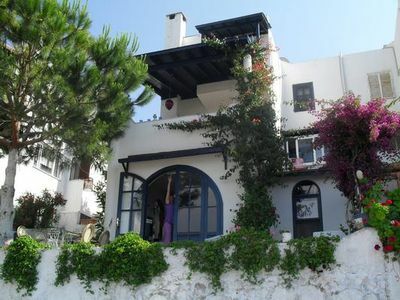 There are many restaurants, cafes and bars in Kalkan town centre. Dalaman Airport is 1 hour and 50 minutes by car. Islamlar is a simple village set in the mountains with spectacular views down to Kalkan and Patara beach in the distance. Kalkan is fifteen minutes drive and the Mediterranean's longest sandy beach Patara is thirty-five minutes drive away. The area is renowned for its trout farms and restaurants. These simple, traditionally built restaurants provide wonderful views down the valley. The menus are simple and absolutely fresh, usually consisting of salads, goats cheese, a few local mezze, delicious fresh trout or chicken, followed by fresh fruit. Superb! 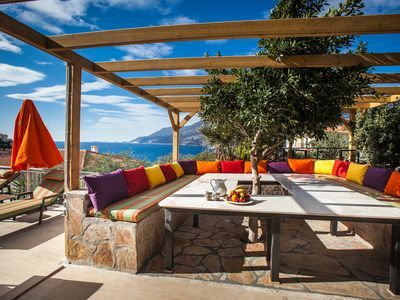 If you prefer something a little more sophisticated the restaurants, cafes, bars, shops and beach clubs of Kalkan are just fifteen minutes drive away. It is possible to arrange a taxi one way or both but renting a car is recommended to discover the area easily. 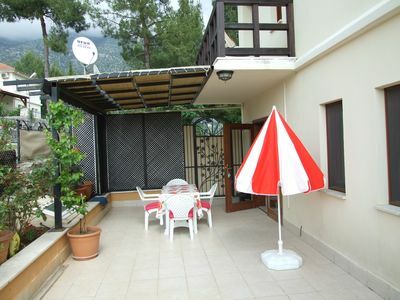 Villa Flower 3 Bedrooms Villa With Private Pool. 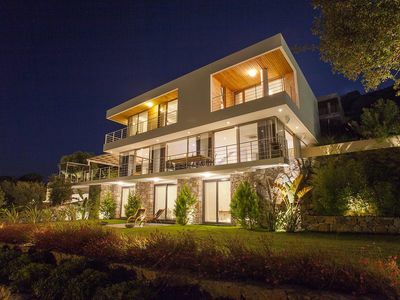 This spacious villa is comfortably furnished with great views from every window. 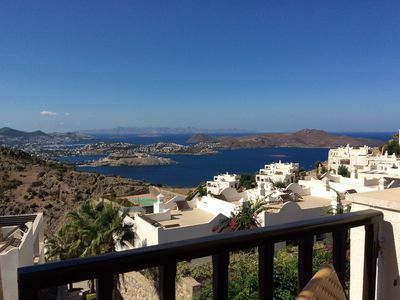 Brand New Luxury Modern Apartment With Stunning Sea Views and Private Roof Pool. for family and friends a holiday "among us".